Another lookbook is released to spread ample smiles among the most devoted fashionistas. I, personally, look forward to every new catalogue, as it provides me with fresh and trendy outfits. More than that, these outfits are created and put together by proficient stylists, which is great. Who, if not these gifted people with creative approach and deep understanding of the fashion world, can come up with gorgeous ensembles? The lookbooks are very helpful in this sense, as they give us the ideas on how to present a certain clothing piece and what to wear it with. Also, checking out the trend updates by various brands lets you keep up with the latest fashion tendencies and make a preliminary list of the desirable items. So let’s enjoy Lulu’s Fall/Winter 2013 lookbook! For the Fall 2013 lookbook, Lulu’s tapped two pretty models, Veronica Zoppolo and Kate Harrison. The title of this newest catalogue speaks for itself: Model Off Duty. There is a very obvious message in it and you don’t have to be a genius to get it. The photos feature the girls donning striking outfits, as if they were walking after the runway shows. It might be considered as a view at models’ lifestyle from the backstage. Creative team JUCO Photo lensed the beauties, posing on the streets of Los Angeles. The collection icludes very stylish outfits that mostly represent street style. You are not likely to spot any highly sophisiticated outfits or ball gowns, but I doubt that this is what you are really looking for. With the daily routine we all tend to face, the last thing we want is to bother with some boresome classic ensembles that may delight our picky bosses. I can tell you, don’t try to satisfy your supervisors, unless they are willing to raise your salary. Before that blissful day comes, there is no need to worry about the dress code. Instead, use the outfits by Lulu’s as inspiration for your own wardrobe. Both looks of the models posing against the truck are anything but appropriate for the office, but who cares? Ripped black skinny jeans are paired with a striped crop top and a gray cardigan over. A pair of stylish sunglasses along with the chunky black necklace accessorize the outfit. The only thing I would reconsider is the pair of black ankle straps. Both beauty and fashion require some sacrifice, but not to such an extent. If you want to stay alive on a chilly fall day, you better opt for a proper footwear piece. The second ensemble would not seem to be so rebellious, if it wasn’t for the stockings in black. They are so grunge, just like the whole look is. A pleaded leather skirt in classic black matches the pullover with some letter patterns. There is a gold necklace that offsets the dark shade of the composition. My favorite outfit though is the one donned by Kate Harrison (the brunette). 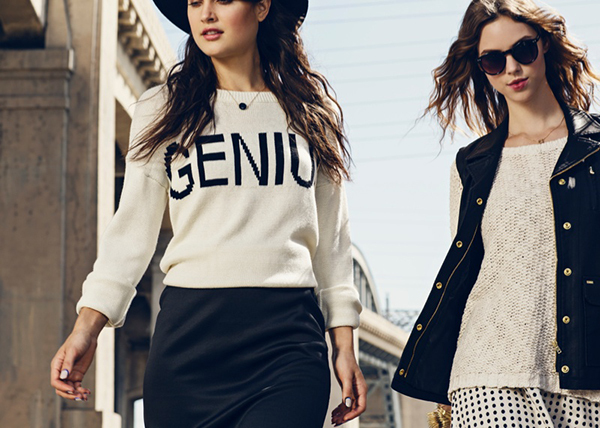 A simple pencil skirt in black of a very moderate length is combined with a cream sweatshirt featuring Genius slogan. I am not sure whether I liked the look itself, or the opportunity to carry this six-letter word on my chest. I also adore the wide-brimmed hat in black as well as the beautiful sandals. But, once again, I would trade them for something more reasonable and reliable. Lulu’s Fall/Winter 2013 Lookbook appears to be very trendy and saucy. All the outfits are definitely in vogue, which makes the catalogue even more appealing. Browse through the gallery to enjoy all the photos!